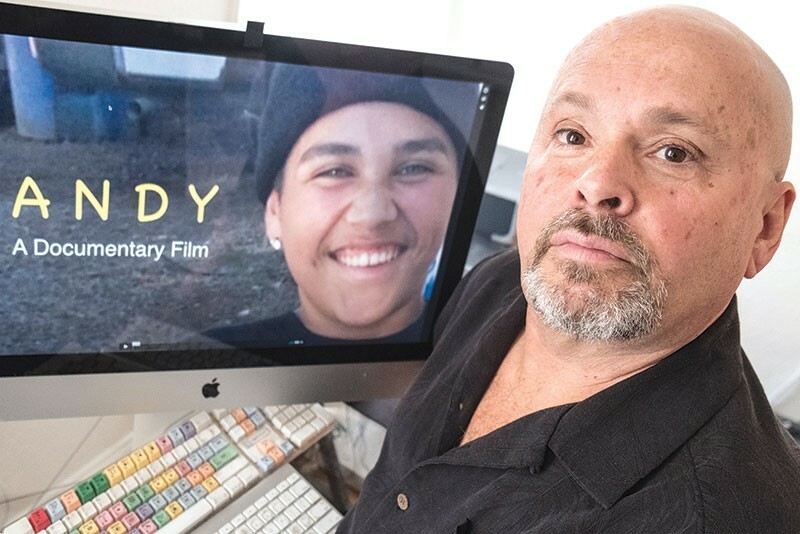 SCREEN TIME Ron Rogers’ documentary about Andy Lopez is slated for release in the fall. Sonoma County Sheriff Steve Freitas is on-screen on a video monitor set up in the Worth Your Weight cafe in Santa Rosa being interviewed by documentary filmmaker Ron Rogers. "Some people made their mind up right away that what the deputy did was wrong," Freitas says, as the crowd looks on intently. "Some people made their mind up right away that what the deputy did was OK."
It's been more than three years since Lopez's death on Oct. 22, 2013, and Freitas' response characterizing a divided community still rings true. Gauging from the tenor and tone of the questions put to Rogers at the fundraiser, it was a bad shooting. "When we held that fundraiser," says the filmmaker, a Sonoma County resident and producer at Blue Coast Films, "I realized that emotions are still raw." Rogers is aiming to release his film this fall and hopes for an airing on PBS. Besides Freitas, Rogers interviewed more than 40 people and needs to raise additional funds to pay for an edit. He's pledged to make a balanced and sensitive film about an event that tore a city apart. Rogers says he was moved to make the film based on the circumstances of the Lopez killing: a young boy carrying an Airsoft replica AK-47, walking past an abandoned lot frequented by kids playing war, gunned down in broad daylight by a cop, in his own neighborhood. "It just got to me," Rogers says. In a community divided by tragedy, he says, "there are actually some people who are trying to find common ground"—and the community can expect to see those voices in his film, along with those for whom the Lopez incident was a life-changing event they're still struggling to get over. Law-enforcement reform took hold in Sonoma County in the wake of the Lopez shooting—but so too did a persistent belief that the subsequent investigation had been whitewashed by the Santa Rosa Police Department and by Sonoma County district attorney Jill Ravitch. Ravitch's office cleared Erick Gelhaus, the sheriff's deputy who shot Lopez, of any criminal wrongdoing. A civil lawsuit filed by the Lopez family is pending in the Ninth Circuit U.S. Court of Appeals in San Francisco. Meanwhile, as the civil suit lingers, sheriff's office reforms have taken root and include the creation of the Independent Office of Law Enforcement Review and Outreach (IOLERO), headed by attorney Jerry Threet. The agency investigates complaints against sheriff deputies. Sonoma County sheriff's deputies started wearing body cams about a year ago, but the Sonoma County Sheriff's Office (SCSO) says that didn't stem from the shooting. "There are clearly some opinions in the community that aren't aligned with ours, and we accept that," says SCSO spokesman Sgt. Spencer Crum. He cited a number of steps Freitas has taken since the shooting—"numerous community healing meetings" and other outreach efforts that include radio appearances and neighborhood meetings. "We are looking for more opportunities like this to engage with the public whenever possible," Crum says. As for the body cams, "it's just another example of our efforts to be transparent, and [our] attempts at gaining public trust." The body cams were put to good use in a recent incident in Boyes Hot Springs that led to a felony assault charge against a deputy who no longer works for the SCSO. Body-cam footage was key in Freitas' decision to push for a criminal investigation into the incident and to push the deputy off the force. Civilian complaints are part of the job, but the sheriff's office says they are pretty rare. "We deal with people in times of personal crisis," Crum says. "We put them in jail, we write citations and enforce laws. These negative encounters will result in some complaints." How many? In 2013, Crum says the SCSO had contact with over 200,000 people "and had only 68 complaints." Short of termination, there's a range of disciplinary actions that the SCSO can undertake with deputies: written admonishment, verbal admonishment, a requirement for additional training, time off without pay. Threet, who meets monthly with Freitas, says he has encouraged the sheriff to consider a year-end summary of excessive-force complaints that protects the rights of deputies while also giving the public some sense of an accountability process that's currently shielded by a state law that protects personnel records from public scrutiny. Crum describes the relationship between the IOLERO and the sheriff's office as "a collaborative effort that is continually evolving. We have found that Mr. Threet takes his responsibility to the public very seriously." As for the summary proposed by Threet, Crum says go for it: "It is our understanding that Mr. Threet is going to publish an annual report. We also report our complaints annually to the DOJ as required by law." For SCSO officers on the beat, the Lopez shooting still casts a shadow, but the nuts-and-bolts work of policing work goes on outside the headlines and viral-video outrages. It's gloomy and quiet in downtown Guerneville on a recent weekend morning as Deputy Sheriff Bryan Jensen contemplates a small pile of broken meth-pipe glass on the hood of his SUV-style cruiser. Jensen's got a quizzical look as he sifts through the glass, removed from a coat pocket of a person he knows is not a meth user. He looks up and has a visible a-ha! moment. Turns out the garment belongs to someone else who does use meth, and Jensen knows that person too.